Board warping problems, which most of the time occur in the winter, arrive at our book-testing laboratory from all over the world. The purpose of this article is to furnish you with some basic information on why such problems do occur. Mirror, mirror on the wall, who has the biggest warp of them all? When paper or paperboards are made, approx. 70 to 80 percent of the fibres float in the machine direction (MD). Paper fibres are hygroscopic. They pick up water when the moisture is high, they lose water when the percentage of moisture is low. Paper fibres expand 4 to 5 times more in their width than they do in their length. Therefore, one must make sure that all cover-materials, boards, endpapers have the grain parallel to the binding edge. Are there guarantees against paperboard warping? What are the basics of a paperboard? All paperboard manufacturers rely on paper-waste which, being a re-cycled product, is hard to control for consistency. Some use newsprint, others magazine papers etc. For example, a high amount of corrugated box content attracts more moisture, whereas groundwood or thermo-mechanical furnish, i.e. soft fibres, respond to less moisture. In addition, papers and boards with short fibres tend to saturate more rapidly and therefore expand and contract more quickly. Long fibred stocks are more stable in this respect and in certain instances, it is possible to exercise considerable control, a factor every mill tries to achieve in a best possible manner. Unfortunately, with today's trends toward recycling, we must cope with shorter fibres. This is also true for the printed papers used as covering materials. There are many different techniques being used to manufacture paper boards. Most important for them is to manufacture a paperboard product that is dimensionally stable. Some structures promise to offer more stability than others. That maybe true, but despite those claims made by some paperboard manufacturers, this bookbinding expert has experienced and analyzed warping problems on all brands and qualities of paper boards made. I have never come across a single warping incident where, at least in my opinion, where the paper boards were at fault. The most fundamental relationship in a print-finishing process does lie in the reaction of papers, boards etc. on each other in the presence of water-based adhesives, that is animal or protein glues, cold-emulsion PVA's, starches etc. 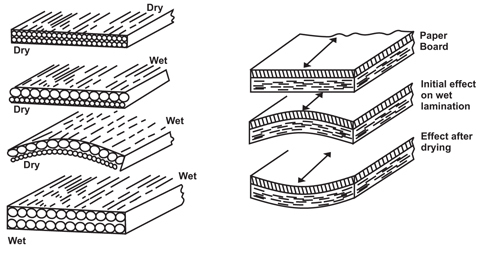 To understand these effects fully, it is essential to have a good understanding of the construction of the fibrous materials and how they react to moisture during the drying and manufacturing processes. These factors greatly influence the performances of the finished products in the ever changing climatic environments. Example, books made in Asia during the summer in high humidity, then transported to a bookstore in Minnesota, where, during the winter, the air is very dry. Paper and paperboards are all based on cellulose fibres, which have a tubular shape. Given the opportunity, these will absorb water by capillary action and as a result, the individual fibres will considerably increase in their diameter, but gain only a fraction in the fibres lying in a more or less parallel direction. As each of the fibres expands in its diameter, expansion will occur. The expansion is across the machine direction. Now, if a binder applies a water-based adhesive onto one side of a paper-board, this will cause the fibres on the surface to expand rapidly. All this does happen, because there is a time lapse before the moisture has penetrated evenly through the board. Therefore, and that is important, expansion will initially be uneven and a curl will be induced into the paperboard. If the same amount of moisture is applied to the other side, the board will flatten out. Now, try to solve a problem sent to our laboratory. A manufacturer produced puzzle boards. They mounted a color printed sheet only onto one side of the board and then they did wonder why the boards warped! Now, as a consultant and the necessary knowledge of the forces at work, you can give them the following advice: “In order to make a board to lie flat, one must mount identical papers onto both sides, same grain direction, same amount of adhesive!”. Timing is critical as well. As you can see for yourself, it is a relative simple solution! Just try to understand Mother nature at work. At the paper mills, all paperboards are carefully fine-tuned to their required moisture content. The pallets are shrink-wrapped to retain that balance as good as possible. Most often, mills furnish instructions about how to handle board shipments. However, a board manufacturer has no means to control the environment at a bindery or at the end user's place. Often such paper products are stored in unheated warehouses or in tropical climates, in places with high humidity etc. During winters, like the ones experienced in the US and Canada, the relative humidity is low. Paperboards, as well as all other materials used for the final assembly should be adjusted to ambient conditions, that is equal moisture contents prior to be bonded. 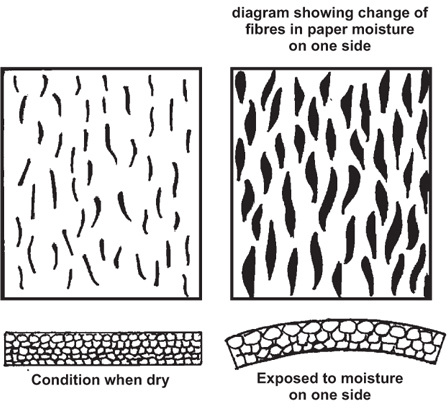 This aids a return to the pre-bonded conditions following drying and curing of the finished products. Now you may ask, what is the best moisture content, what are the best conditions for storage? One of the best answers may be an advanced study made by the late Professor Eric Simon, who taught Offset Printing Technologies at one of Germany’s most prestigious universities, the Fachhochschule in Stuttgart. Together with his graduate students, he conducted extensive research on the stability of paper fibres, which is most critical to the printing process. This study found that the ideal moisture content of paper and paper boards are between 7 to 8 percent. The paper fibres are most stable in an environment with a relative humidity of 40 to 50 percent. This is the same percentage that is recommended by the US Governments Library of Congress. They have done extensive studies on the most ideal storage conditions for books and other printed materials. But there are other factors we must consider. All board warping problems seem to surface during winters. One must wonder why? With this basic educational session on paper, board, moisture and conditions, we are now able to discuss this topic, in-depth. Another question that often crops up from publishers is, what will happen to the finished books if they are stored in an un-heated warehouse? The cold will not damage the books. But, when the temperature rise above freezing point, there will be excessive moisture and this will damage the books. Therefore, it is most important, that they control the relative humidity. Warping of the boards has very little to do in this regard. Balancing the forces is the trick to control paper boards from warping. Cover materials – printed papers, UV coated, laminated, cloth etc. All five components must complement each other. The board is the centre. If too much case-making adhesive is applied, the boards will react as discussed in the last issue. If the casing-in adhesive allows the paper to expand more than it should, it will pull the cover inwards. If moisture is unable to “wet” the endsheets and let them expand, they are unable to shrink and pull the covers inwards. If the adhesives lack the necessary humectants to keep the moisture in this sandwich, we have a problem, again. In short, it is a difficult balancing act, especially if the products must endure various climates, dry and moist environment. 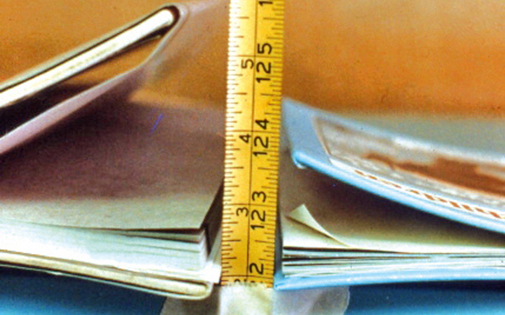 A paperboard manufacturer's explanation is that in the normal course of the bookmaking process, cover boards are subjected to varying temperature and humidity conditions. The more dimensionally-stable the cover board is, the more capable the board will be adapting to these conditions, that is returning to its desired dimensions after the expansion or contraction that occur. Warp happens when a cover board is unable to do so. These are the words of one of the world’s largest board manufacturers. And so, it looks like board warping is a bookbinder’s problem! Gerald P Mielke is a bookbinding adhesive chemist and in the past, chaired an in-depth study on book cover warping. This being a project for BMI, the Book Manufacturer’s Institute. In his conclusion, he stated that the overwhelming cause of a cover warp is being caused by moisture which is absorbed or released and with the resulting expansion or contraction of the materials which compromise the book cover. Unbalanced expansion or contraction of any of these components relative to each other or within themselves may manifest itself as a warp. 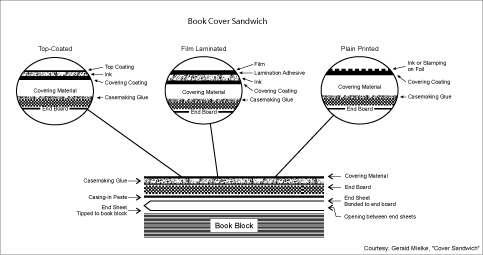 Mielke stated that moisture vapour barrier coatings or laminations on covering materials, even cover materials impervious to moisture, can interfere with distribution of moisture in the rest of the sandwich which in turn compromises the cover. He goes on to say that warping has tended to be more of a dry season occurrence, which makes the problem more apparent in the wintertime than in the summertime. With cold outside air, which at best holds very little moisture, when it is warmed, dropping the relative humidity and with it, creating very dry conditions. The drier conditions can cause uneven drying in the finished cover. This can contribute to the warping problem. It can also dry out some of the materials going into the sandwich compromising the cover, which makes them react more strongly in the presence of moisture provided by the adhesives to laminate the sandwich together. My personal experiences also centre on dry book blocks created by heatset web offset and digital printing. A low moisture content in the book block will play havoc with carefully manufactured book covers and boards. This is a recent problem. More so, since we see more and more book manufacturer’s utilising digital web-printing concepts which result in dry or low moisture book blocks. Let me share with you a personal experience. Back in the 1970’s, being in charge of the world’s first fully automated in-line book-manufacturing system, we tried to produce 70 hardcover bound books a minute, web-printing and hardcover binding books off a 38 inch mill-roll of paper. The low moisture in the book block made the quality paper boards warp! Eventually, that in-line system had to be pulled apart. The point is, paper, after heatset printing, needs time to recover. (Best is 72 hours) Only by de-warping the book covers twice in each direction were we able to control the amount of book cover warping, that is we learned, despite of all the obstacles to keep them flat. Yes, John Cole was right, book cover warping is a bookbinders problem. And they must be kept in control. This is an interesting experience, especially now, in the digital age of printing and the “instant” book which must be shipped within a day. It is deja vu.